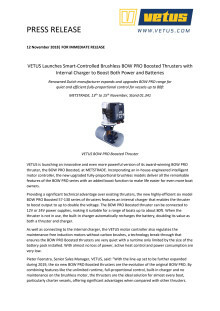 VETUS is launching an innovative and even more powerful version of its award-winning BOW PRO thruster, the BOW PRO Boosted, at METSTRADE. Incorporating an in-house-engineered intelligent motor controller, the new upgraded fully-proportional brushless models deliver all the remarkable features of the BOW PRO series with an added boost function to make life easier for even more boat owners. Providing a significant technical advantage over existing thrusters, the new highly-efficient six model BOW PRO Boosted 57-130 series of thrusters features an internal charger that enables the thruster to boost output to up to double the voltage. 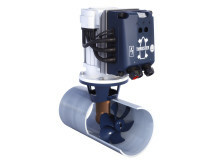 The BOW PRO Boosted thruster can be connected to 12V or 24V power supplies, making it suitable for a range of boats up to about 80ft. When the thruster is not in use, the built-in charger automatically recharges the battery, doubling its value as both a thruster and charger. 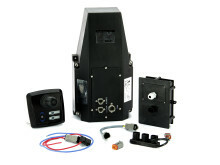 As well as connecting to the internal charger, the VETUS motor controller also regulates the maintenance-free induction motors without carbon brushes, a technology break-through that ensures the BOW PRO Boosted thrusters are very quiet with a runtime only limited by the size of the battery pack installed. With almost no loss of power, active heat control and power consumption are very low. Pieter Feenstra, Senior Sales Manager, VETUS, said: “With the line-up set to be further expanded during 2019, the six new BOW PRO Boosted thrusters are the evolution of the original BOW PRO. 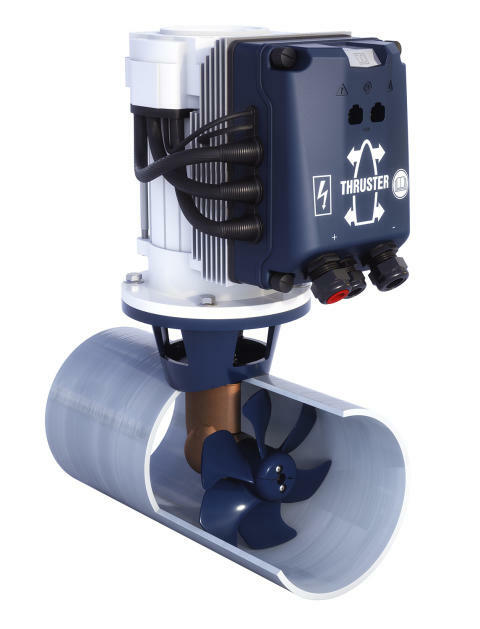 By combining features like the unlimited runtime, full-proportional control, built-in charger and no maintenance on the brushless motor, the thrusters are the ideal solution for almost every boat, particularly charter vessels, offering significant advantages when compared with other thrusters. 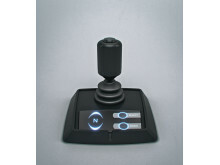 The thrusters allow users to command as little or as much power as needed with fingertip control. Operating with CAN-Bus protocol, BOW PRO Boosted thrusters feature a choice of two different control panels – the fully-proportional basic panel (BPPPA) and the fully-proportional panel with local and hold function for easy docking (BPPJA), allowing the boat to be held alongside to pick up or drop off crew or dock single-handed. Introduced over the last year and recipients of an Innovation Award at Miami International Boat Show, the BOW PRO range for 20-55ft boats has already earned an enviable reputation as powerful, quiet thrusters with unlimited run times and brushless motors. 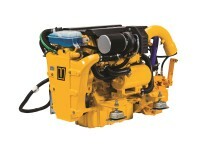 All models in the series combine VETUS’s highly-regarded electric thruster technology with its extremely quiet RimDrive, to provide near silent operation and precision proportional control. 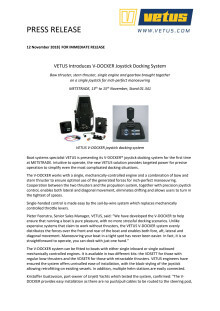 For more information on the VETUS bow thrusters see www.vetus.com. At this year’s METSTRADE, VETUS is holding a joint press event with YANMAR to reveal the latest product updates on Stands 01.345 and 01.341 on Wednesday, 14th November at 12pm noon. To register your interest, please email Jules at j.riegal@saltwater-stone.com. VETUS is an internationally-renowned developer and manufacturer of complete marine product systems ̶ including engines, generators, bow thrusters and control panels ̶ for recreational craft and small commercial vessels. VETUS prides itself on innovation and the majority of the 4,000 products it supplies are part or wholly designed by its in-house engineers. Founded in 1964, VETUS has its headquarters near Rotterdam, in the Netherlands, as well as subsidiaries in 16 other countries and a worldwide distribution and service network. All products marketed by VETUS are part of a complete system, with any connecting components also available for ease of use. VETUS strives to ensure everything it supplies is as simple to install and maintain as possible, to make life on the water more enjoyable for its customers. 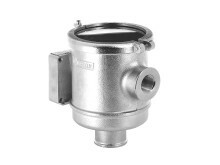 VETUS Maxwell is introducing the rugged, highly-durable FTR33038M water strainer for below-waterline installations. 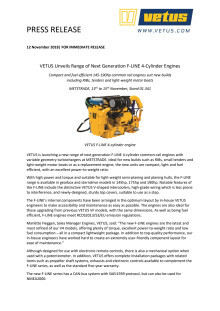 VETUS is launching a new range of next generation F-LINE 4-cylinder common-rail engines with variable geometry turbochargers at METSTRADE. 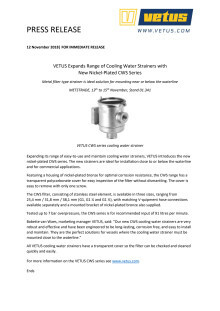 Expanding its range of easy-to-use and maintain cooling water strainers, VETUS introduces the new nickel-plated CWS series. 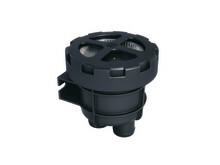 The new strainers are ideal for installation close to or below the waterline and for commercial applications. 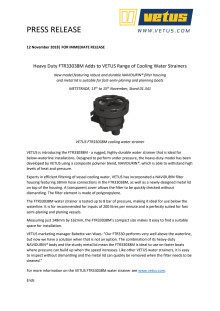 VETUS is introducing the FTR33038M - a rugged, highly-durable water strainer that is ideal for below-waterline installations.